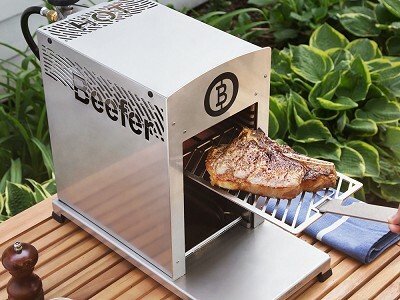 Beefer is a high heat grill that does things a little differently. It's powered by infrared heat from top-mounted ceramic burners. When we say high heat, we really mean it. Beefer reaches 1,500 degrees—compare that to a typical grill that can hit around 500-600 degrees—in just minutes. That is the magic temperature for getting restaurant-like results when you’re grilling protein like steak. It sears flavors in and creates a crispy, caramelized crust on meat in seconds. It cooks quickly and evenly to a perfect juicy doneness—same goes for chicken and seafood. It works with veggies, too. The infrared technology built into Beefer is used by restaurants to get consistent, fast, and delicious results. 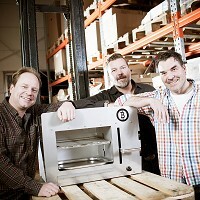 The steak-loving team at Beefer (Frank Hecker, Marc Kirwald, and Frantz Konzen) made this propane-powered grill to recreate that steakhouse experience in your own backyard. How long does it take to cook steak/fish/veggies? At the highest grilling level, food can brown as quickly as 45 seconds to 1:15 minutes, and is primarily based on the ambient temperature and temperature of the food at the start of cooking. 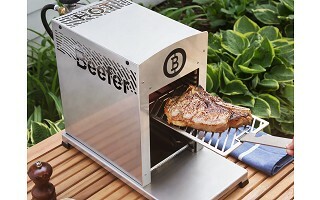 Keep in mind that the top of the Beefer is great for searing whereas the lower levels will provide more ambient heat. 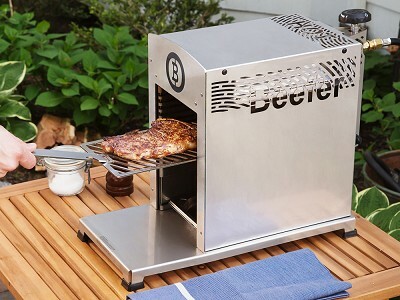 Beefer is a high heat grill that does things a little differently. It's powered by infrared heat from top-mounted ceramic burners. When we say high heat, we really mean it. Beefer reaches 1,500 degrees—compare that to a typical grill that can hit around 500-600 degrees—in just minutes. That is the magic temperature for getting restaurant-like results when you’re grilling protein like steak. It sears flavors in and creates a crispy, caramelized crust on meat in seconds. It cooks quickly and evenly to a perfect juicy doneness—same goes for chicken and seafood. It works with veggies, too.